It was mother’s day in Australia a few weeks ago and hence I found myself reflecting on what mother’s day means to me. I thought about my grandmothers, one blessed with good health and longevity and who only passed away last year in her 93rd year. The other who had her life cut short by illness at the age of sixty-six. In the naivety of my childhood she seemed old, maturity has taught me that she had definitely not reached old age. I thought of my own precious mother and the things she has done for me especially in the last few years. I also remembered fondly, as I regularly do, my mother in law, who was also taken from us far too young. I found myself questioning my beliefs and wondering if she in anyway knows the journey of her granddaughter. Being a mother is certainly not what I anticipated nor expected. Yes, there are definitely some aspects that I envisaged such as the unconditional love you have for your child and the joy that only your own child’s smile can bring. I never expected the worry, constant care and the challenges constantly felt when parenting a child with special needs. This difference can be very isolating and stayed with with me quite strongly over the first few months of this year. Going back to Christmas and the New Year, like mother’s day and other important calendar days, they bring reflections of where life is and one often measures this against their personal expectations. My expectations would be for my daughter to be like her peers, bursting with excitement about Christmas and the festivities it brings. This was not the case and it brought a lot of mixed emotions. Following on from Christmas, we had summer holidays and again this brought expectations such as spending time at the beach, life relaxed and easy for a few weeks. This wasn’t the case for me, we went to the beach and we had a good time but there was sadness in the difference in our lives. At the end of February, Orla reached the milestone of 2 years since her bone marrow transplant. This is another achievement and all her tests showed everything to be as good as possible. She was also able to receive her first live vaccinations as her immune system is now well developed. This milestone, although a massive achievement which I definitely appreciate, was in fact marked with much grief for me. I had expected Orla would be developmentally more advanced by this point. I anticipated she would be walking, feeding herself and talking, we were never told not to expect this. I didn’t expect that her life and mine would be constant therapy and hard work to achieve things that just come so innately for most. At this time, I read back over some of my entries to this blog when Orla was diagnosed, prior to her transplant and felt crushed by the hope I could feel in my writing and that hope was replaced by grief and exhaustion. I now realize that it was really only at this point, I was really starting to come to terms with Orla’s diagnosis and the real impact of it. The planning and preparation for her bone marrow transplant started almost immediately after diagnosis. There was no time to waste and I’m very grateful for this. However, there was also no time for grief and even then we didn’t know what we were grieving for other than our precious daughter was not going to be or do the things we anticipated. Even now, no one can tell us. I’m now more accepting that this in fact the very essence of what I actually need to come to terms with…the not knowing. This is not easy. Anyone who tells a special needs parent to not compare their child to other children really should think about whether they could. You learn, I feel, to deal with the comparison and accept as much as you can. Before you know it, you find something that you feared becomes your norm and reality. Orla remains very happy and she is progressing slowly. She is practicing standing and stepping with a frame with far less protesting at physio. Her physiotherapist, Belinda and I have been researching different things in regard to Orla’s feet and ankles and have ordered her a new pair of boots that we will be excited to get in a few weeks. We really hope this will help Orla’s walking and stretching her Achilles tendons which remain tight and stop Orla from placing her feet flat on the ground when she pulls up to stand. Orla had her ears cleaned out under sedation a few weeks ago at the children’s hospital. She had a persistent build up of wax in her ears, which her hearing tests revealed to be adding 20-30 decibels of extra loss to her underlying hearing impairment. Orla will no longer let any doctor near her ears to clean them out and she is too big and strong to be held still now. The sedation as the paedatrician stated, “just took the edge off” and the other benefit is she won’t remember. Even with the sedation, it still took 5 people to hold and distract her including the doctor actually removing the wax! Orla is now more engaged and reacting to sounds she wasn’t prior and there is a noticeable difference in her vocalisations. Alpha Mannosidosis affects every cell in the body and hence can affect every organ too. Orla’s eyes therefore need to be monitored and were checked a few weeks ago. Like her ear and hearing checks, the eye check was also a challenge, especially inserting the drops needed to dilate her pupils. We discovered at this appointment that yet another aid is needed, for long distances – glasses! No big deal aesthetically, what was a concern was how will we keep them on! Orla still likes to eat things that aren’t for eating, and she does chew her glasses at times but they have made a noticeable difference and she is significantly more compliant wearing her new specs than her hearing aids. In fact, Orla has quite a reputation for her mishandling of her aids. In January, she managed to inadvertently swallow a battery from her aids and of course, as luck would have it, was literally half an hour before we were due to leave home to catch the overnight ferry to Tasmania for our holidays. We instead had to make a detour to the children’s hospital for an X-ray to check the whereabouts of the battery and then also check it was passed by Orla, and it was, a few days later. We missed the boat that evening, our holiday delayed 24 hours, and Orla blissfully unaware of the all the fuss! Orla continues to enjoy kinder, the staff at the centre where she attends are wonderful and are enjoying the journey of following her development. A few weeks ago, Orla surprised them by pulling to stand at one of the tables and then promptly climbing on top. Orla has developed a great like for climbing in the past few months, secondary to her love of bouncing. Orla currently aligns herself closely with the words of Tigger from Winnie the pooh, “Life is not about how fast you run or how you climb but how well you bounce”. 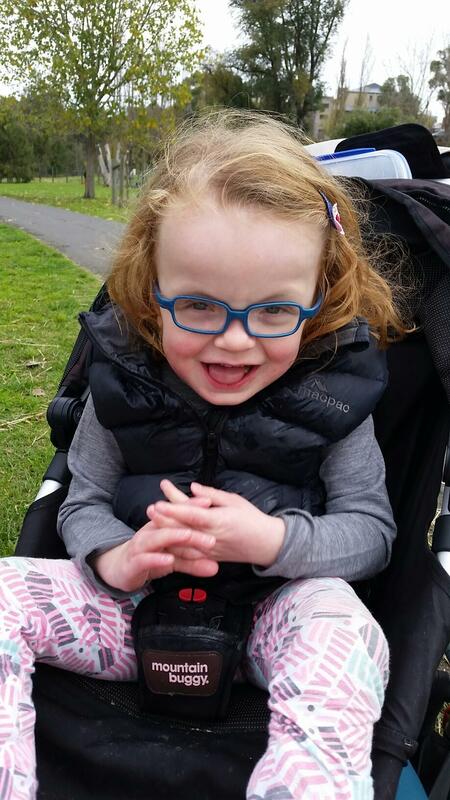 Below is a photo of the growing girl taken a few weeks ago wearing her new specs! You are to be congratulated on an honest story, a soul searching story but more importantly you have written the storyâ¦..
Motherâs Day is an emotional day for so many, I am blessed that I still have my Mum to share the day with. She is now 92 and not in the best of health but is just coping with her daily needs as well as my dadâs needs. I hope one day I get to see you on one of your visits to Tassie, I look forward to catching up with your Mum and hearing about Orla and her progress. I trust the new boots are a great help with her mobility, and I wish you and Ed strength and hope with Orlaâs therapy. Felicity, you are such an inspiring and caring mother. I am sure that you have a terrific support team with Ed and your family. Well done to you all. Orla looks terrific with her glasses and seems to be growing into a beautiful little girl. I pray that God gives you the strength and determination to continue supporting and nurturing Orla in achieving her maximum potential in life. Dearest Flick & Ed, What awonderful honest ‘BLOG”, Orla looks so blissfully Happy, you are amazing people, strength is always found, without even realizing.Your gorgeous mother keeps us informed, on our lovely special lunch times. Your post touched my heart. It is obvious that your motherly love is the deepest there is, and Iove the honesty in your writing: sharing your vulnerable moments is no easy feat. Thanks for sharing, and say hi to your gorgeous daughter and great husband! Thanks for the very interesting update. A bit sobering, a bit inspiring. Familiar stuff about (not) staying still for procedures, and can so totally believe it about the battery and the interruption to your holiday travel. Best wishes to Orla and also to you and Ed. John, Judith, Tim & Hollie.